How connected is your engineering team? While interdisciplinary engineering has been a buzzword for years, we find that many engineering teams continue to operate in silos. The introduction of advanced CAE systems is slowly changing that, and engineering teams are enjoying multiple benefits as a result. One reason that engineering teams might still operate in silos is that they are still using legacy systems that support only one engineering discipline; the process engineer uses one software system, while the fluid engineer must use another--and the two systems don’t integrate. Communication among engineering teams is cumbersome, stifling collaboration and communication among members of a project. Conventional systems also do little to facilitate communication with other stakeholders, both within and without the organization. There is often considerable rework, as a change by one team means that all other teams must then make their own individual updates, one at a time. Even the perfect project must be completed sequentially, with each team “taking its turn” on the design, resulting in much lengthier R&D cycles and time to market. Communication among engineering teams is seamless, even if teams are decentralized in multiple international locations. It is possible to communicate with other project stakeholders, including customers and suppliers, throughout the supply chain. Greater volumes of data can be stored and reused, supporting the standardization of designs. Less time is required for error checking. R&D and time to market are both shortened. One of the most interesting benefits of advanced CAE software is that it allows easy integration with modeling software, so engineers can create virtual simulations. 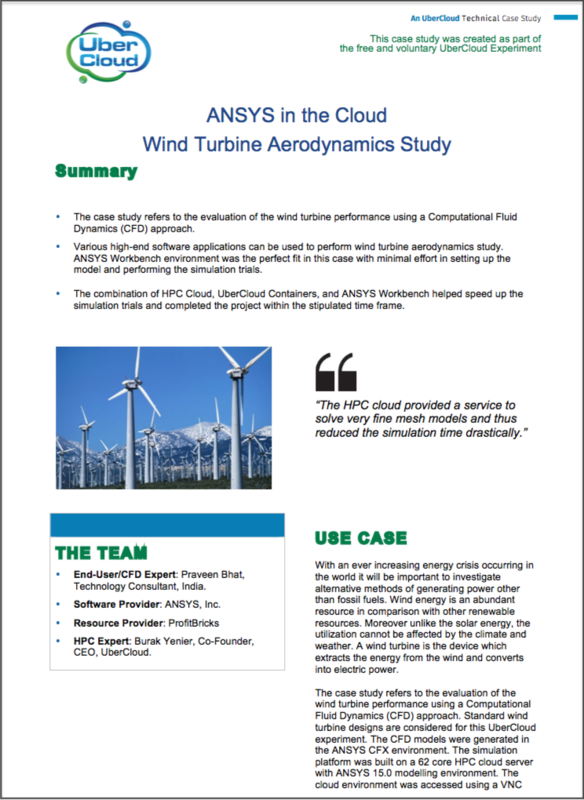 COMSOL Multiphysics is one excellent example of advanced cloud-based CAE software. COMSOL Multiphysics is a general-purpose software platform, based on advanced numerical methods, for modeling and simulating physics based problems. COMSOL Multiphysics, with its multiphysics capabilities, is especially suited for coupled and multiphysics simulations, making the description of real-world multiphysics phenomena and systems possible. For this project two COMSOL applications were used; one acoustic model and one parametric radio frequency (RF) heating model from the COMSOL Multiphysics application library. The acoustic model simulates the acoustic pressure at certain frequencies in a typical living room equipped with stereo speakers and other typical living room furniture. The RF model is a model from the COMSOL Multiphysics application library. It shows dielectric heating of an insulated block, caused by microwaves travelling in an H-bend waveguide. The H-Bend Waveguide simulated. The image to the left shows the magnetic field (Arrows) of the waveguide and the temperature in the dielectric block (yellow). The image to the right shows the almost perfect speed up gained when adding more compute nodes. In the case of the RF model, the model is small and possible to compute on almost any modern computer, but the amount of frequencies that need to be computed, together with the different geometric parameters, requires a high number of simulations. Even if the computation of one parameter takes only 30 minutes, the total computation times can become unacceptably large when the number of parametric values increases. For a frequency model with a large geometry where higher frequencies are of interest, a large amount of memory is needed to be able to compute the model at all. Many users in small or medium companies do not have the hardware needed on premise, but might still need to handle these types of models sporadically. 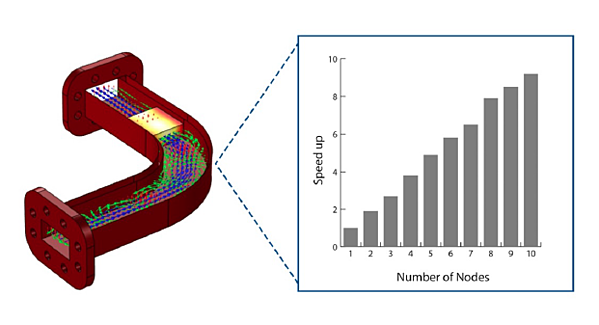 The research team concluded that the HPC bare-metal cloud solution is a beneficial option for COMSOL users who want to obtain higher throughput and more realistic results in their simulations. Furthermore, for parametric studies, the increased speed on cloud-based clusters proved to be almost perfect, demonstrating that a ten-node cluster can increase productivity almost tenfold. For this project, two COMSOL applications were used: one 2D model and one 3D model of an industrial fragrance extraction boiler. Both models use specific modeling for mass and heat transfer of fluid flows and immobile solids, built from the COMSOL Multiphysics Heat Transfer Module. The heating/cooling sleeve around the reactor is thin. The image shows the surface temperature (in degrees Celsius) of the fluid at the end of the heating phase of the thermal cycle (scale colormap). The swirling flow from the bottom right inlet to the upper left outlet is clearly visible. These two models were chosen since they represent two frequent options for thermal and fluid flows models. The 2D model enables exploring a wide range of operating condition, while the 3D model is suitable for detailed analysis and optimization. Only one form of parallelization of multiphysics simulations has been tested: shared memory parallelism (SMP). In the case of the 2D model, phase change has been added to allow for water vaporization. This slows down the computation so much that the simulation takes days on a powerful engineering computing laptop or desktop PC. For the 3D model with a large geometry, a large amount of memory is required to compute the model at all. Many users in small or medium companies do not have the hardware needed on premise, so the cloud provides an ideal hardware extension to handle these types of models sporadically. The research team noted that using cloud computing services eliminates the need to invest in powerful in-house workstations or servers that aren’t used year-round. Furthermore, future steps of the project will benefit from updated hardware and software available in the cloud.. And finally, once validated, the containerized environments provided by UberCloud required no end-user intervention.